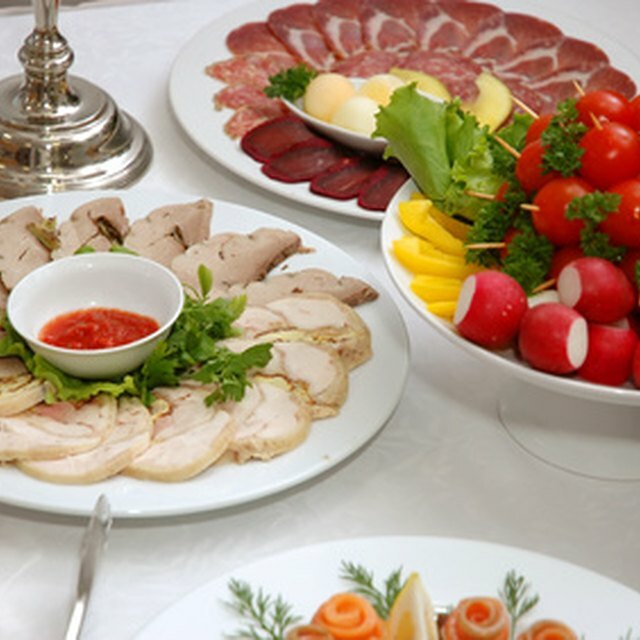 Whether you are hosting a buffet in your own home or are a professional caterer who supplies the food and drink for your clients' parties, receptions or business luncheons, a stylish presentation counts a lot toward setting the right ambience. If you put yourself in the mind-set of a stage manager and pay attention to the color scheme, the placement and the lighting, your table could be remembered as the best-choreographed event of the day. Determine how many tables you are going to need for your event. This will be based on the combination of how many food items you will be serving and the size of the room in which the tables will be set up. If it's a small event, you can easily do one table or two tables set up in a "T" formation. If it's a large crowd, it may be more practical to have two large tables set up on opposite sides of the room but mirroring each other in their content or multiple smaller tables that are waist-high and could be placed strategically around the room. The smaller tables would feature different items; for instance, a meat and cheese table, a desserts table, a chips and dips table. Select tablecloths that are either a crisp white linen or are in a color that is complementary to the dishes and the food that will be displayed on them. Tablecloths should cover the surface of the table but not be so long as to trail to the floor where they can be tripped over. An alternative is to use table runners but only if the surface of the table you're using is attractive. Choose a centerpiece that isn't going to dominate the entire table, poke your guests' eyes out as they move along the line or (if it's a floral arrangement) smell so strongly that it obliterates the scent of the food. If your table arrangement is a "T" formation, place the centerpiece where the two tables intersect; it will look stunning, but it won't get in the way of anything. If you're using waist-high tables that are 3 feet or less in diameter, a votive candle in an attractive holder will be charming. If you're using long tables, place three to four small centerpieces down the middle. Use small- or medium-size plates in white or a color that is complementary to the rest of the decor. The plates, napkins and silverware should be placed at whatever is going to be the starting point of the buffet. You may want to place these items at both ends or, if you prefer, have a separate table set up for them. It's also smart to have glasses set out on a separate table where they're less likely to get knocked over by someone realizing he forgot to get a spoon. Better yet, have beverages served to the guests after they have found a place to sit down or congregate. 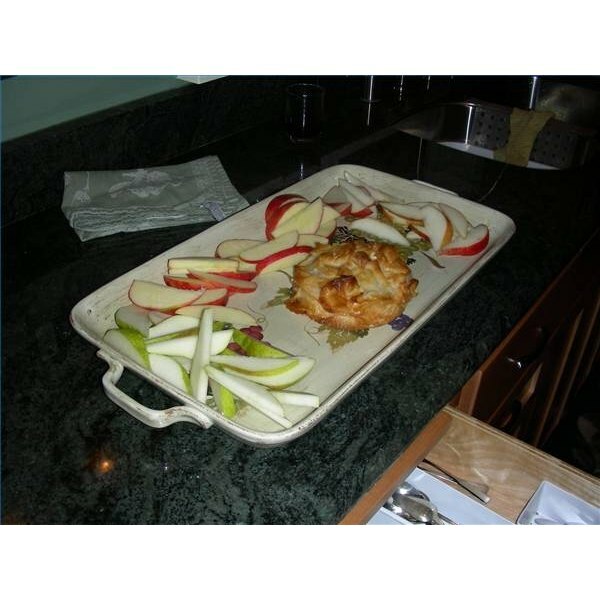 Use matching tiered serving plates to maximize the amount of usable space you have on the table. If they are metallic, they'll do a nice job of reflecting whatever lights are in the room. Place these equidistantly along the center line of the table. The exception to this is if you are catering a tea party and want to cluster things like the various finger sandwiches and scones all together in one spot. Take advantage of natural light if your catered event is during the day by placing the table near a window but not so close as to create a greenhouse effect on the food. For evening events, use soft lighting throughout the room or position the table under a chandelier. If you use a wide table, guests will be able to serve themselves from either side. If the table is set up against a wall, make sure that guests don't have to do a lot of reaching, especially across dishes that have a lot of sauce on them. If you're catering a Christmas event and your catering table will be up against a wall, consider hanging wreaths as a backdrop on the wall instead of using a centerpiece. Additional ideas for elegant dining can be found at the URLs listed below. Use platters as your centerpieces. Stay away from patterned or bright-colored tablecloths that will draw attention away from the food. Candles can be beautiful and throw a pleasing soft light on the buffet presentation, but you need to be cautious using them if there's a large crowd or children running around. You don't want all of your beautiful work to go up in flames! In addition, if candles are your only light source, the guests may get frustrated trying to figure out what the various food items are.